Custom File Icons. This version comes with some serious eye candy. 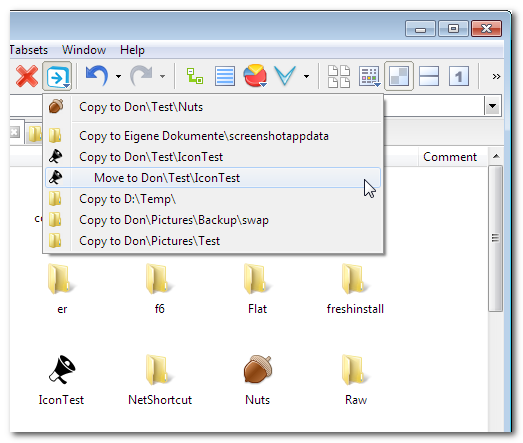 Windows can assign icons to file types, but here are new icon tricks that go much further: Assign custom icons to all folders with a certain name, e.g. "movie" or "docs", or on a certain drive. 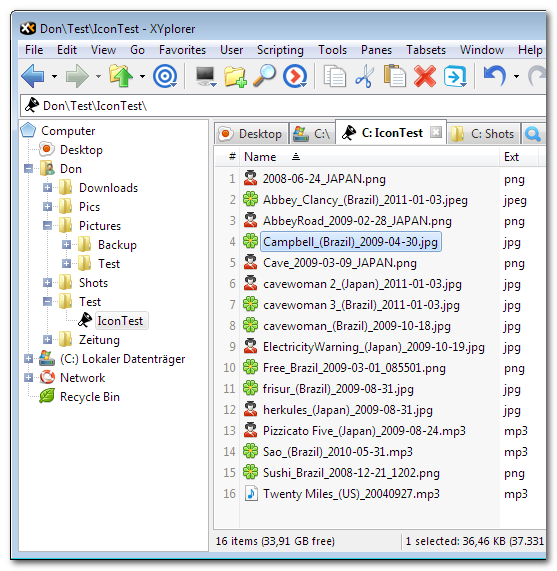 Assign custom icons to particular files, e.g. to "C:\pagefile.sys", or to all files called "readme.txt", or to all JPEGs containing "2013" in the name. It gets even better: You can take your associated icons with you wherever you go: Custom File Icons are fully portable without changing a single byte in the host system. It all runs from a USB stick, full stealth. Hence this feature is also called Portable File Icons. 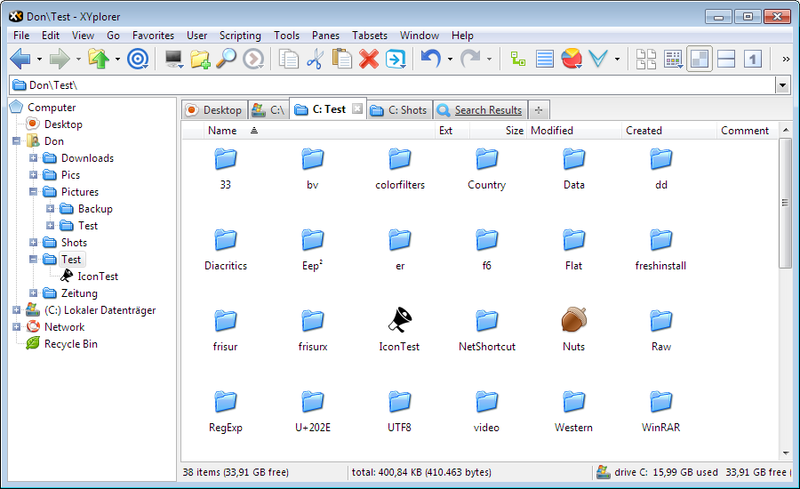 With Custom File Icons no windows standard icon assignments are touched at all. 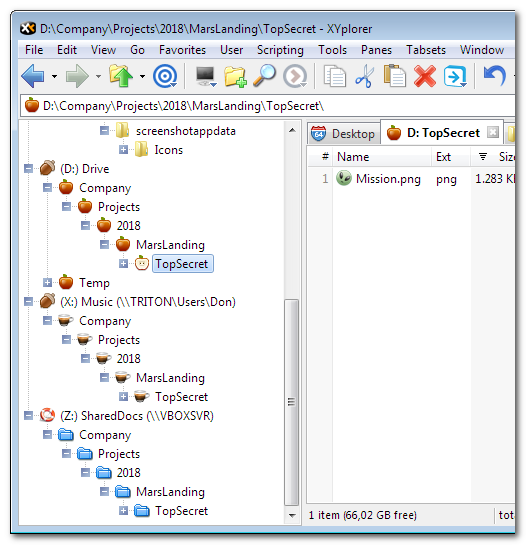 The icons you see are taken directly from ICO and EXE files present on the host system or on your USB stick. No registry changes involved. 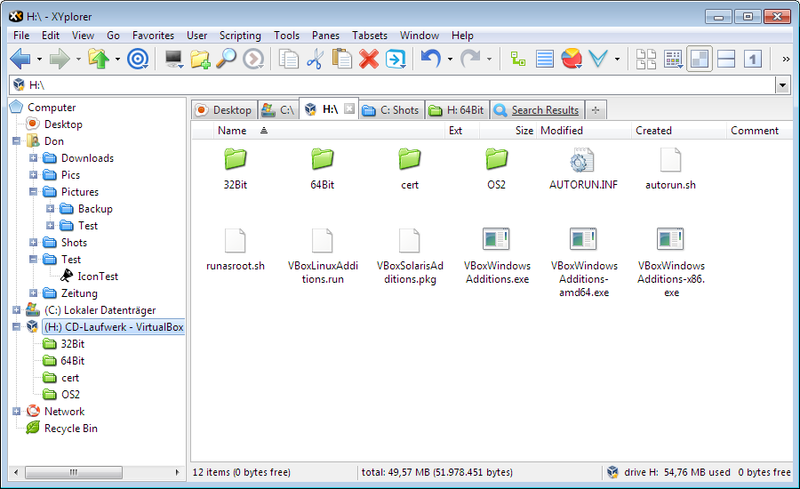 You can as well color folders by their drive and thus give a strong visual clue about the location of a folder. This might save your skin when moving crucial files in a high pressure situation. Always know where you are, without even looking. 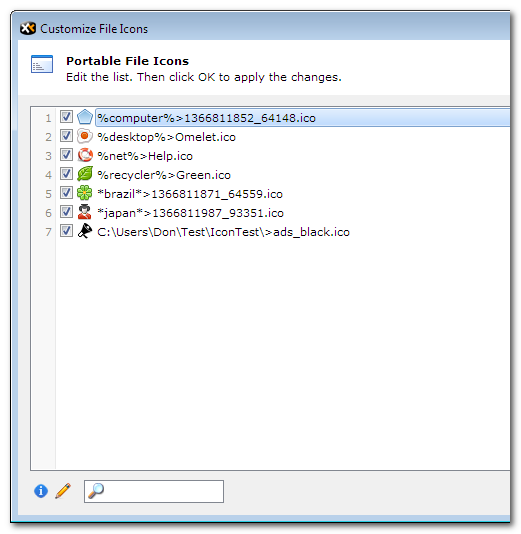 Anything that has a system icon (the icon shown in the file list) can be stated as custom icon source, typically you would take either executables or *.ico files. 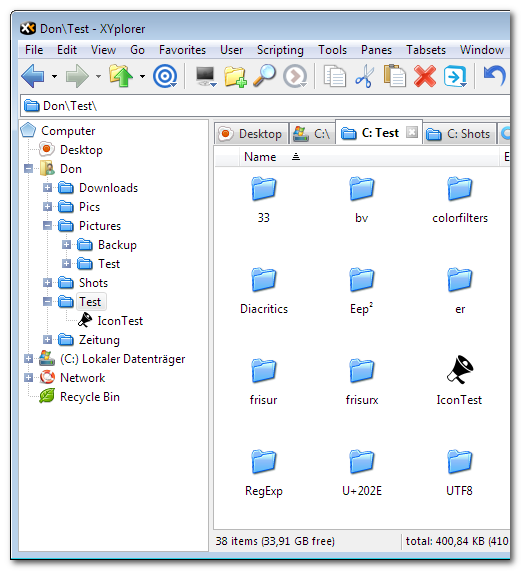 The icon source can be stated as full path, relative path, or ProgID ("Notepad"). Even XYplorer native and environment variables are supported. 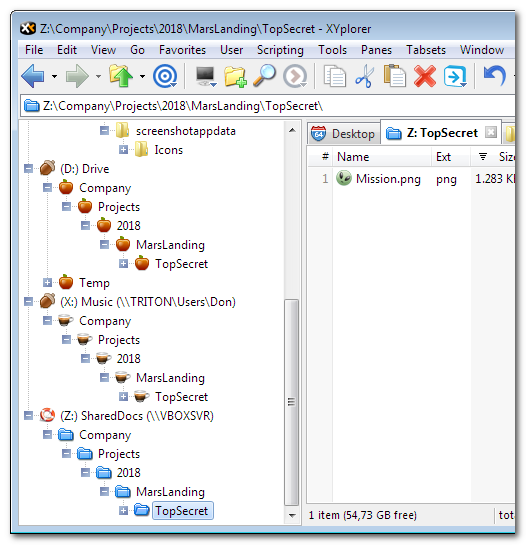 Paths to icon sources are resolved relative to XYplorer's Icon path, subfolder of the application data path. 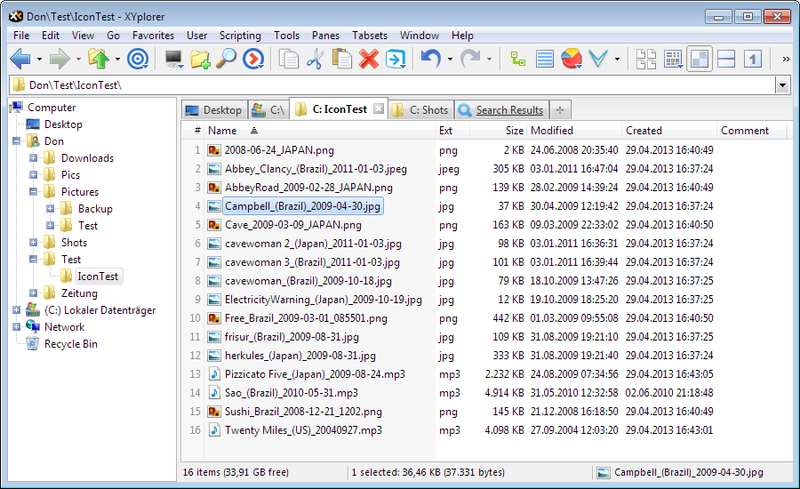 Customizing file icons is a one-time job. Once you have customized your icon associations there is nothing else to do or to learn. The feature is simply there for you and works for you. All you have to do is sit and watch. As simple as TV. For details and advanced options please see the Help file. 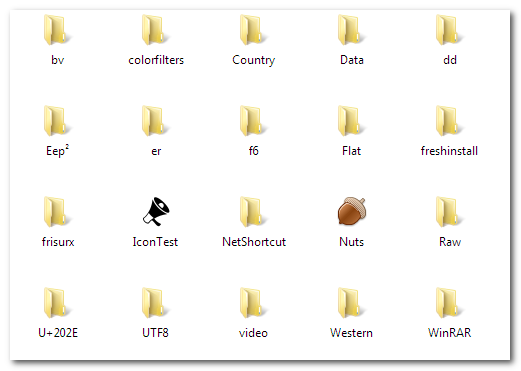 pics\         matches all folders named "pics"
pics\*        matches all files in folders named "pics"
pics*\*       matches all files in folders beginning with "pics"
readme.txt    matches all files named "readme.txt"
Here are some icons for testing (including all icons used in the above examples). For all I know these icons are free for commercial and uncommercial use. Thanks and credits go to the designers of these icons! In XYplorer, go to the default icons path (simply paste <xyicons> into the Address Bar and go there), and paste the extracted icons into this path. 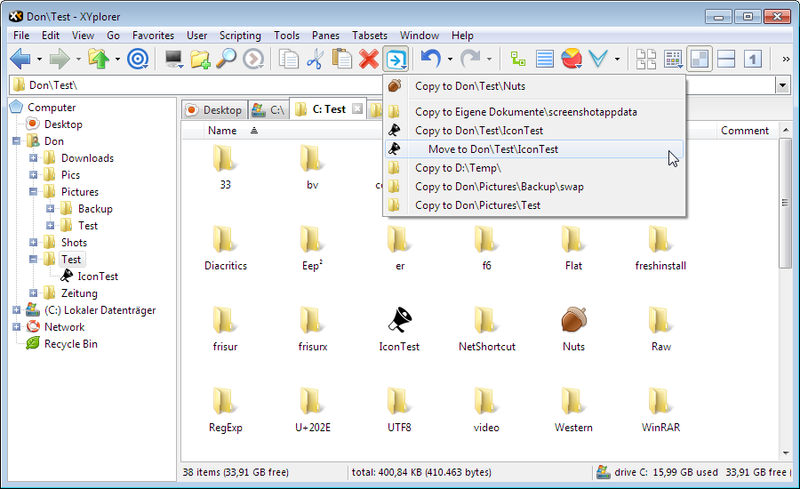 Once again: With Custom File Icons no windows standard icon assignments are touched at all. 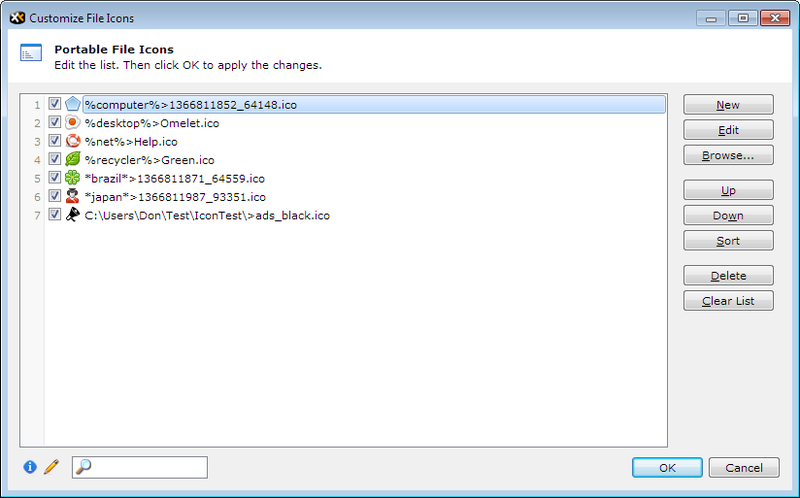 The icons you see are taken directly from ICO and EXE files present on the host system or on your USB stick. No registry changes involved. There is a master switch to toggle the whole thing on and off: Configuration | Refresh, Icons, History | Icons | Enable custom file icons. Changing icon definitions or enabling/disabling the feature all works smoothly, ultra-fast, and on the fly. No restart required. Custom File Icons. Now you can customize the icons of the currently selected tree folders. The open state icon is only shown in the folder tree. Its typical use is to make the selected folder stand out from the crowd. Custom File Icons Toolbar Toggle. 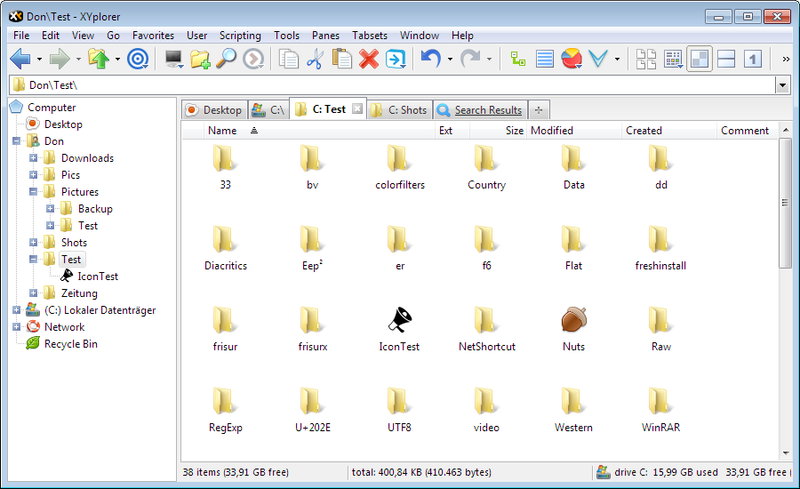 The new toolbar button "Enable Custom File Icons" lets you quickly toggle custom and standard icons. No restart required. Note that the button's right-click menu has some useful stuff. Credits for the icon go to http://www.everaldo.com/. File Times in UTC. Now you can show all file times in UTC (Coordinated Universal Time), i.e. in the universal time format that is independent of your current time zone. If you are a pilot or frequent flyer who often crosses time zones you will be delighted to see your files showing the same universal timestamp, no matter whether you are in Los Angeles, São Paulo, Rome, or Tokyo. In other words, XYplorer now supports portable file times. Universal Time Stamp. Now you can as well modify the UTC file times (as they are stored under NTFS) directly: Simply append a "Z" (UTC marker according to ISO 8601) to the time string, e.g. "2013-05-16 12:00:00Z". That way you can guarantee the same universal timestamp regardless of any DST (Daylight Saving Time) offset in effect. Very nice for software developers with a global market. Universal Time Search. Now you can as well find files by their UTC timestamps. In other words, your search-by-date templates now are perfectly portable and work reliably independent of the time zone of your current host system. 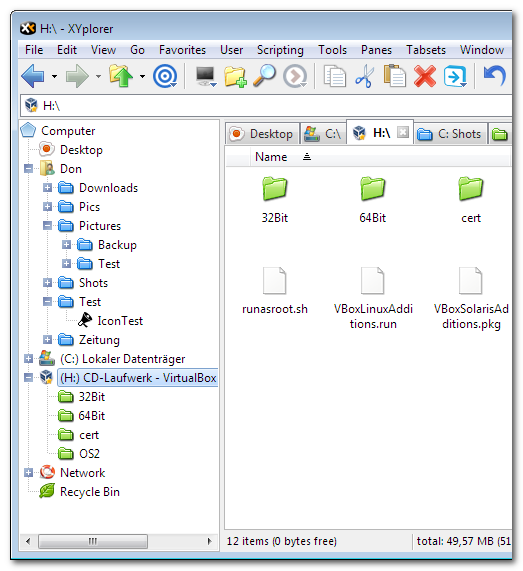 XYplorer 12.40.0300 has been released on 31-May-2013. It just has some bug fixes.